Online stream anime episodes, Watch Naruto Shippuuden Episode 103-104 English Subbed online and free episodes. Anime Episode guide, Chapter Naruto Shippuuden Episode 103-104 English Subbed The Four-Corner Sealing Barrier The teams set off. Naruto introduces Sai and Shino to each other. The sealing team prepares a search and barrier jutsu to seal the Three-Tailed Beast. Kakashi’s fighting team is suddenly attacked by Gozu and Guren while the guarding team begins fighting as well. 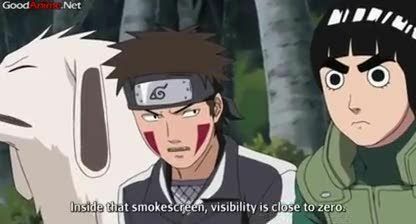 Lee, Tenten and Kiba finish off Rinji’s subordinates with ease. Meanwhile, Naruto angers Guren saying it’s his fault Yūkimaru went over to ‘her side’ and that he won’t allow her using him as a tool.